It’s a British Crime Spree! I’ve teamed up with eleven bestselling authors to offer crime readers an absolute treat – free stories! 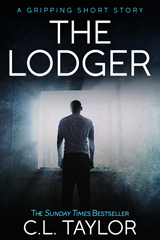 Originally a three part serial in My Weekly magazine THE LODGER is a gripping 9,000 word short story. All you need to do to download it for free is enter your email address. You’ll also get free membership to the CL Taylor Book Club – just in time for my next competition when I’ll be giving away THREE bottles of champagne!